Ojingeochae Muchim is sometimes also called Ojingeochae Bokkeum (오징어채 볶음). For your reference, the difference between muchim and bokkeum is that muchim means to toss and coat with seasoning and bokkeum means sautéed or pan-fried. 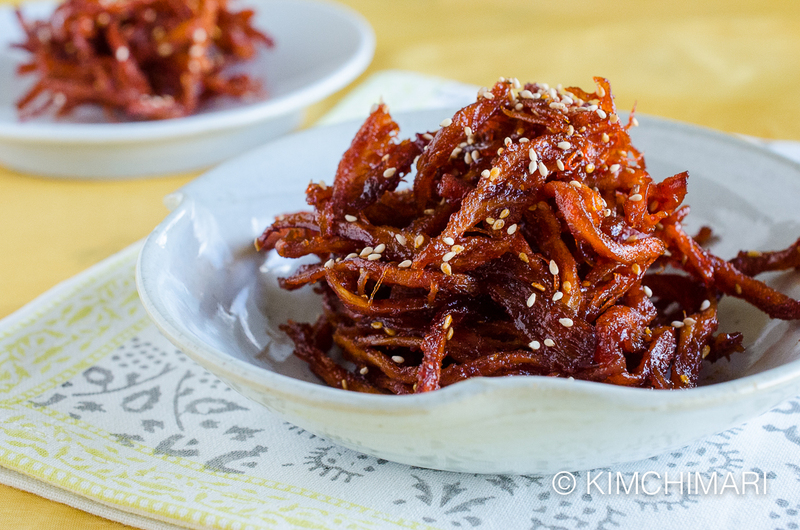 And I guess it is called by both names because this spicy dried squid recipe includes both cooking methods – it is first tossed in gochujang sauce (muchim) and then quickly pan-fried (bokkeum). 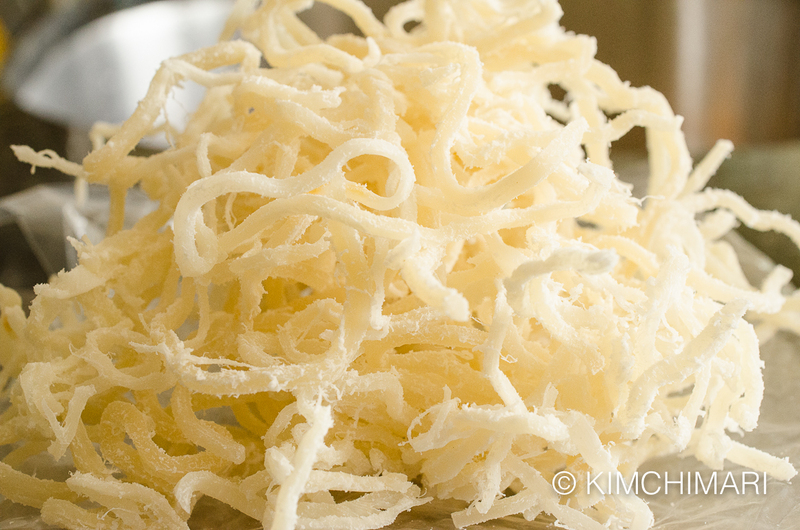 Ojingeochae (오징어채) literally means ‘julienned squid’ but it somehow always refers to dried squid that is seasoned and cut into thin strips not fresh ones. Note that these dried squid strips already come seasoned in packages which is great to eat straight from the bag as snacks or with beer! But it often contain MSG, so beware of that if you are allergic to MSG. But now, thanks to the Italians (calamari) and Japanese (ika), most people seem to be quite comfortable with eating squid. BTW, calamari and squid are actually different – see my post on Ojingeo Bokkeum for more info on nutrition and a recipe using fresh squid. Still, dried squid is not as well known in the US. 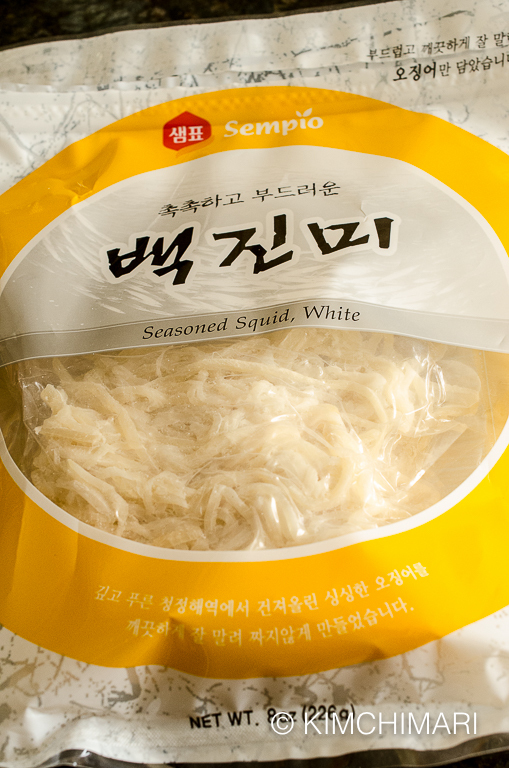 It is kind of an acquired taste because the dried squid has a stronger and more concentrated flavor than fresh squids. But once you get over the stinky smell, they are sooo good. The dried squid also goes great with beer so try that sometime!! Boil hot water (about 2 cups). Put squid in a metal colander or sieve. Gently pour hot water over the dried squid strips. This process softens the squid but also removes some of the seasoning, making it less salty. 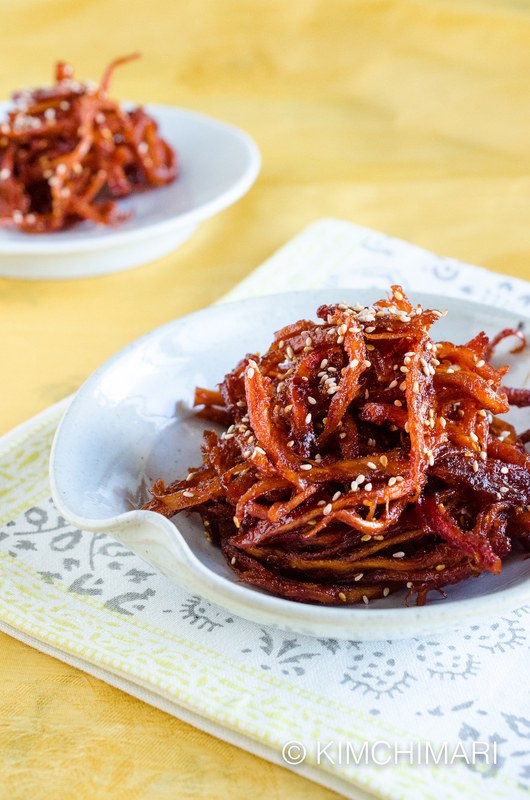 Skip this step if you prefer chewy ojingeochae. If you do skip, also remember to use less soy sauce. 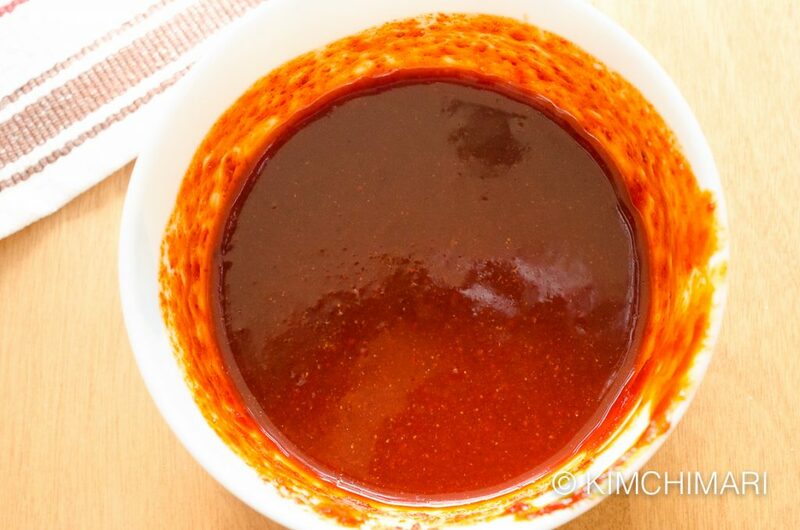 Mix gochujang, gochukaru, sake, soy sauce, sugar, garlic powder and maple syrup to make seasoning for dried squid recipe. 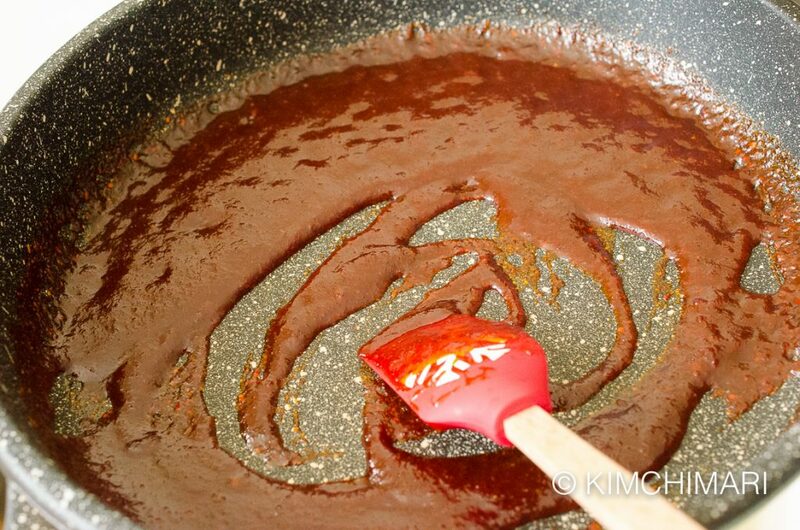 Heat pan on medium low heat and simmer the seasoning sauce for 2 minutes. Stir a few times. We don’t want to reduce the sauce, just cook the raw taste out of it. Turn heat to LOW. 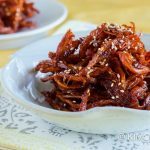 Toss and mix dried squid strips with the sauce. Mix until squid strips are evenly coated. Turn OFF heat. Mix in 1 tsp of mayonnaise. Also, if you are using corn syrup, this time is when you will be adding it also. Adding mayonnaise is optional. It does kind of round out the seasoning and also keeps everything more moist but flavor wise, it is really not that noticeable in my opinion. Sprinkle lots of sesame seeds on top and that’s it! Most popular Korean side dish for dosirak (lunchbox) and for everyday meals. 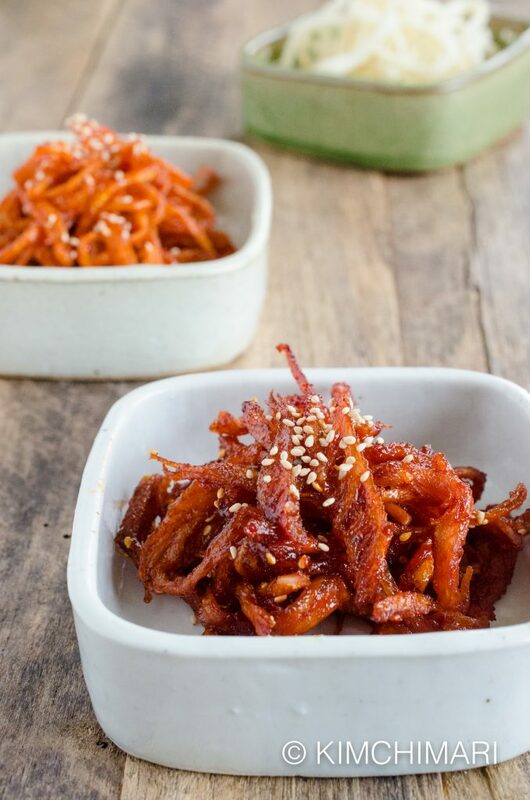 The spicy and sweet gochujang sauce is quite addicting when paired with the salty, chewy dried squid. Easy to prepare and keeps well up to weeks in fridge. Mix in 1 tsp of mayonnaise. 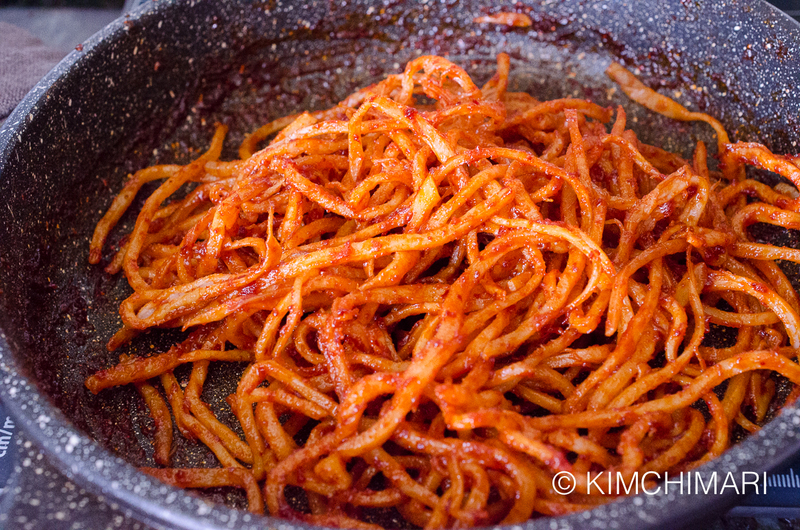 Most spicy Korean dried squid recipes and many Korean side dish recipes use corn syrup. Most recipes use it because that is what Koreans have used for many years. Also they say you need to use corn syrup because it adds a sheen to it. It is also cheap. But I stopped using it for health reasons and I find maple syrup does the job wonderfully. Corn syrup is also problematic because adding it at the wrong time can make everything become rock hard. So if you are going to use corn syrup in Korean side dishes, always add it at the very end and turn OFF heat right after or just add after heat is off. On the other hand, maple syrup never hardens, no matter when you add it so that’s also a plus. You can store ojingeochae muchim in the fridge and it will store for many days, even weeks. Use ojingeochae muchim inside rice balls or kimbap. They make great stuffing for them. 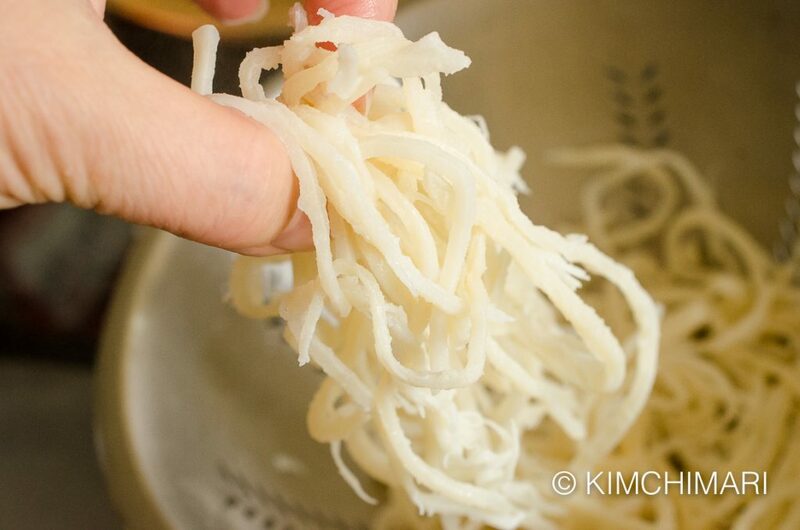 Well, hope you get to make some – it will be a great banchan to have anytime! PS – I have added ojingeochae to my store if you need to buy online. It’s under Dried Foods category. can you tell me what taegu is ? Taegu 대구? If you mean the fish, it’s COD. No, there’s no minimum time. Yes, some people don’t cook the squid at all and you can do that too. It’s up to you. I kind of like to cook mine a little bit – just lightly just so the sauce is fully absorbed into the squid. Maybe for 1-2 min at most. It is kind of up to you. The uncooked version will taste a little fresher but will be fine that way too. Try it! Hope you get good results.Thanks for asking. Thanks for sharing this wonderful recipe. I am very fond of Korean food and always try new recipes. This one is new for me and would serve for my family after cooking. Having too much fun with your site today! My aunt always picks up squid for me when she and my grandmother visit the asian food store. I like eating it straight out of the bag, but now I want to try this!